Where's the starfish? Where's the jellyfish? Where's the clownfish? What starts as a game of ocean hide-and-seek quickly turns into something more significant in this environmentally-minded book from award-winning French illustrator Barroux. "Starfish, Where Are You?" is an almost wordless tale about marine pollution that offers readers the chance to discuss environmental concerns in a gentle way. This touching and elegant picture book is filled with intricate scenes and three sweet characters to spot on every page. 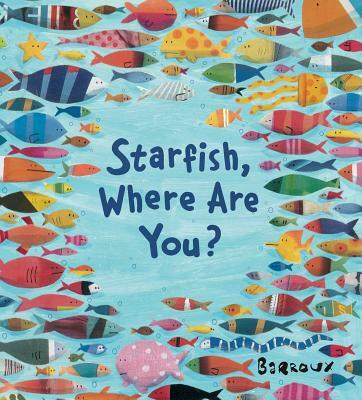 With only a few sentences and beautiful, heartwarming simplicity, this charming story puts the power back in the hands (or fins) of the natural world with a bold, stunning twist at the end.Readers are asked: "Where's the Starfish? Where's the Jellyfish? Where's the Clownfish?," and are tasked with finding each on the following pages as the fish are slowly forced out of the spreads by more and more trash accumulating in the ocean. A whale, upset with all the junk, pushes it all back onto land and comes back to the ocean with a big grin on his face."